Russia's hybrid military forces attacked Ukrainian army positions in Donbas 77 times in the past 24 hours with four Ukrainian soldiers reported as wounded in action (WIA), according to the press service of the Anti-Terrorist Operation (ATO) Headquarters. The largest number of violations was recorded in the Mariupol sector, namely 39 militant attacks were reported. For the first time over the past few days, the militants employed multiple rocket launcher systems near the village of Bohdanivka, where the enemy also attacked the Ukrainian positions with 120mm mortars. In the same direction, the occupiers fired 120mm mortars on the Ukrainian defenders near the village of Chermalyk and the town of Krasnohorivka. 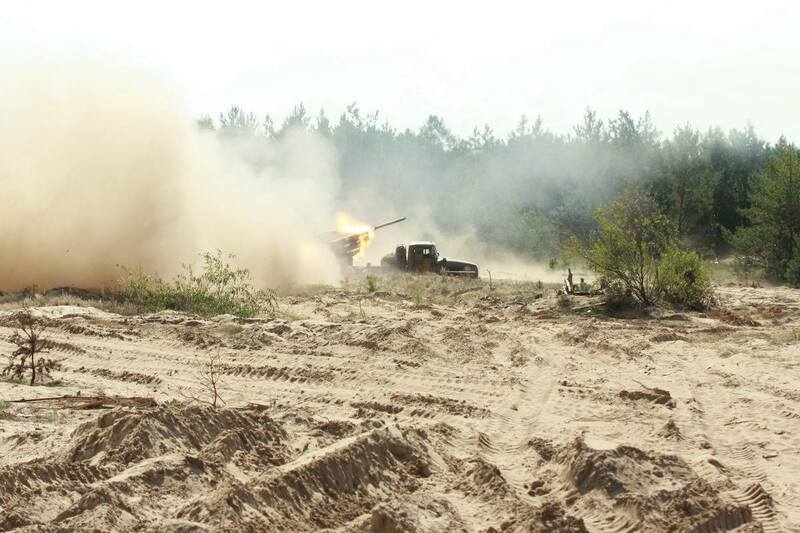 In addition, the Russian-backed mercenaries used 122mm artillery systems near Chermalyk. The situation was also tense near the villages of Vodiane, Shyrokyne, Pavlopil, Novotroyitske, Hnutove and Talakivka, and the town of Maryinka, where the enemy repeatedly shelled the Ukrainian fortified positions, using small arms, grenade launchers and 82mm mortars. Read alsoOSCE: "DPR" members instructed to deny SMM passageIn the Donetsk sector, the illegal armed groups attacked Ukrainian soldiers 26 times. The situation remains hottest in the vicinity of the town of Avdiyivka, where the militants systematically opened fire from 120mm and 82mm mortars, tanks and less powerful infantry weapons on the Ukrainian fortified positions. In addition, the occupiers used banned mortars and tank shells against the fortified positions near the village of Pisky. The situation was also tense near the villages of Zaitseve, Novhorodske, Verkhniotoretske, Opytne and Nevelske. The invaders were active in the Luhansk sector. Yesterday, they fired 120mm mortars several times on the Ukrainian defenders of the villages of Krymske, Kriakivka and Novotoshkivske. Moreover, the Ukrainian fortified positions near Krymske came under fire from 122mm artillery systems. In addition, from time to time, militants used small arms and grenade launchers near the villages of Stanytsia Luhanska, Donetskiy and Novo-Oleksandrivka, and the town of Popasna. Furthermore, the enemy used 82mm mortars near Novo-Oleksandrivka.